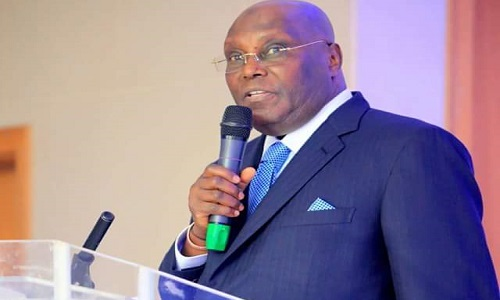 The New Initiative for Credible Leadership (TICP) has described the policy document of the presidential candidate of the Peoples Democratic Party, PDP, Alhaji Atiku Abubakar, as half-baked and a package of empty promises. The group said after a careful analysis by its team of policy experts drawn from, it was unanimously agreed that the policy document lacks any meaningful development template for the Nigerian state. Steven Onwu, national president of the group, said the promises made by the PDP candidate in the policy document should not be taken seriously as he cannot fulfill any of them. The group wondered why Atiku, who was at the helms of affairs between 1999-2007 is just coming up with his policy document. He said said at a press conference that “The first observation in the said policy document is the reference to 2025 as its date of actualization of its set out objectives. While it is curious to state that the Nigerian Constitution provides for a four-year tenure for elected officials, (2019-2023) the insistence on 2025 is an indication that the said document a mirage and one not in tune with reality. “The policy document also stated the intent to “sell all four national refineries, and cut corporate income tax to be one of the lowest in Africa.” It also stated plans to “expand oil and gas reserves and boost upstream and downstream production.” But, it was silent on how this was going to be achieved given the fact that it was going to sell all four refineries. “The document was also silent on the alternatives when the refineries are sold. It was also silent on how the process of the sale of the refineries. At this point, we are constrained to add that we might be returning to the era of the Privatisation of Government. Recall that Mallam Nasir El-Rufai while testifying before an ad hoc Senate committee investigating the privatization and commercialization of government businesses from 1999 till date, stated that Atiku Abubakar, may have influenced the sales of government enterprises to his friends while he superintended over the Privatisation programme of the Federal Government. “The New Initiative for Credible Leadership is also alarmed that in all the issues raised, not a single mention was harped on how to strengthen the institutional framework to reduce waste and corruption in the system. While we assume this is deliberate, it smacks a mockery of the entirety of the document. “The PDP Presidential Candidate also contradicted himself when he promised amongst other things to crash the price of petroleum products to between N87-N97. While this negates the deregulation of the downstream oil sector that he promised in his policy documents, it also raised a red flag on how the government under Atiku Abubakar would be able to dictate or set a template for petroleum prices when such is usually dictates by demand and supply as standard in a free market setting. “On the critical security sector, it was observed that the only meaningful sentence was the decentralization of our security agencies. While this might sound absurd, it raises vital questions bordering on implementation templates. “It also refuses to address how the government would ensure the security of lives and properties of all Nigerians regardless of their status. Instead, it went on a wild goose chase. “The New Initiative for Credible Leadership is therefore alarmed that the policy document of the PDP Presidential aspirant does not meet up with its set yardstick on leadership that would translate the hopes and aspirations into tangible realities. “The worrisome aspect is the fact that the PDP Presidential candidate has operated at the highest level of governance in the country (1999-2007) and still cannot come up with a policy document worth its name.